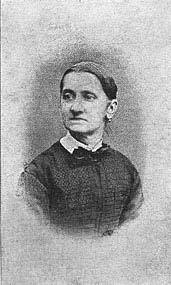 Prešeren's mistress, the mother of his three illegitimate children. She was born into a poor family, her godmother was Julija Primic's mother. She was considered to be a beautiful, but an impetuous girl, who drew the admiration of many men. Prešeren met her at Blaž Crobath's and began to have romantic feelings towards her. After she gave birth to their first child, she had it fostered; this created an unbridgeable gap in her relationship with the poet, which he was never able to overcome. His stormy and exhausting relationship with Ana had an important influence on Prešeren's life.